Preface: Americans would be disgusted if the might of the U.S. military and the riches of the U.S. treasury were used to support one Christian faith (say Methodists) in a shooting war against another faith (say Luterhans). We would be even more offended if the U.S. backed one Hindu sect in a war against a competing Hindu sect, or one school of Judaism against a competing school of Judaism in an armed battle. But that’s exactly what we’ve been doing … backing one Islamic faith against another. We are not siding with one sect or the other. Nor are we claiming that all people of any particular sect are bad or violent people. What we’re saying is that the whole problem is that the U.S. is taking sides … in someone else’s religious war. Neither assumption is correct. In fact, we are fighting a religious war on the same side as the Muslim jihadis. Unfortunately – as shown below – this is neither wild-eyed conspiracy theory or breathless hyperbole. Specifically, the U.S. has directly inserted itself into a sectarian war between the two main Islamic sects, backing the “Sunnis” and attacking the “Shiites” (also called “Shia”). See this, this and this. 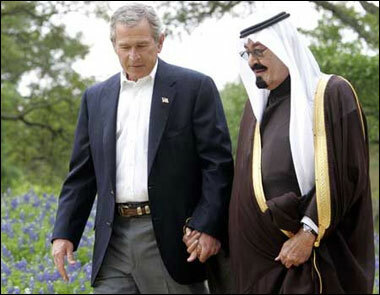 Saudi Arabia is the center of the Sunni branch of Islam. It is also the center of the most radical sect of Islam … the “Wahhabis” (also called “Salafis”), the most radical and terrorist-minded Sunni sect. But the U.S. has long supported the Madrassa schools within Saudi Arabia which teach radical Wahabi beliefs. The U.S. has also supported the most radical and dangerous Sunni elements around the world. For example, the U.S. National Security Adviser admitted that the U.S. created, organized and armed the Mujahadeen in Afghanistan to fight the Soviets. The Mujahadeen are predominately Sunni. The Mujahadeen eventually morphed into Al Qaeda, which is a Sunni organization. We’ve long supported Sunni terrorists in Chechnya. We support MEK terrorists – who are Sunnis who target Shias – in Iran. We support the brutal Sunni government in Bahrain as it crushes its majority Shia population whenever it pushes for democratic reform. We supported Al Qaeda Sunnis in Bosnia. The “rebels” in Syria who we’ve been supporting are Al Qaeda and Muslim Brotherhood. Why should Americans care if our government is backing the Sunnis over the Shiites? Because we are supporting the side which carries out most of the terrorism. Indeed, Sunni Muslims commit most of the terrorist acts worldwide. Sunni extremists accounted for the greatest number of terrorist attacks and fatalities for the third consecutive year. More than 5,700 incidents were attributed to Sunni extremists, accounting for nearly 56 percent of all attacks and about 70 percent of all fatalities. Among this perpetrator group, al-Qa‘ida (AQ) and its affiliates were responsible for at least 688 attacks that resulted in almost 2,000 deaths, while the Taliban in Afghanistan and Pakistan conducted over 800 attacks that resulted in nearly 1,900 deaths. Secular, political, and anarchist groups were the next largest category of perpetrators, conducting 2,283 attacks with 1,926 fatalities, a drop of 5 percent and 9 percent, respectively, from 2010. Could our support for Al Qaeda terrorists all over the world come back to bite us? Our backing of Al Qaeda in Afghanistan led to 9/11. * Top American government officials have also implicated the Saudi government in the 9/11 attack. Our backing of Sunni extremists in Chechnya led to the Boston bombings. Our backing of Sunni extremists in Libya led to attacks on our embassies in Libya and Tunisia. Postscript: Not only have we been backing the Sunnis against the Shias, we have also backed the Sunnis against secular leaders such as Saddam Hussein and Gaddaffi. * The question of whether 9/11 or the Boston bombings were false flags is beyond the scope of this post.